The long answer is a little more fun. Statistically, there’s never been a wing player like him. In the regular season, he’s already played 37,785 minutes (39th all-time), scored 22,591 points (30th), averaged 22 points a game (30th), grabbed 6,164 rebounds (150th), dished out 3,935 assists (100th), tallied 1,499 steals (40th), earned a 20.7 PER (52nd), submitted a 27.8 percent usage rate (19th), accumulated 131.2 win shares (34th), made 6,101 free throws (17th) and drained 1,679 3-pointers (ninth). The first number (minutes) and the last two (free throws and 3s) explain Pierce’s career better than anything: He’s one of the finest, most durable inside/outside offensive players ever, and that’s before you factor in his career shooting splits (45% FG, 37% 3FG, 81% FT). He also hasn’t been a slouch in the postseason: In 116 playoff games (and counting), he’s averaged 39.6 minutes (33rd), 21.4 points (34th) and 6.5 rebounds (117th) with 43/35/83 shooting splits, making 190 3s (11th) and 714 free throws (24th) and even winning a Finals MVP (in 2008). Combining the regular season and playoffs, Pierce could approach 45,000 total minutes by the end of Boston’s current playoff run. With no sign of slowing down. All right, so let’s say Pierce plays four more years (realistic) and finishes with regular-season numbers like 45,000 minutes, 27,500 points, 7,000 rebounds, 4,500 assists, 7,000 made free throws and 2,000 made 3s. Again, those are SAFE estimates. Here’s how those numbers would land on the all-time list today: 15th, ninth, 104th, 73rd, seventh and third, giving him a résumé that doesn’t resemble anybody’s — with one notable exception: Kobe Bean Bryant, who’s headed for 50,000 minutes, 35,000 points, 7,000 rebounds, 6,300 assists, 8,500 made free throws, 1,900 made 3s and 45/34/84 shooting splits (if you’re making an equally realistic projection for his next few years, removing all future Germany trips). and yeah, I know I’m opening myself up to dozens of wheelchair e-mails from the Los Angeles area. Quick tangent: When I was growing up, Celtics fans revered John Havlicek for his legendary durability — by the time Hondo retired in 1978, he’d played a then-record 16 seasons, logged a then-record 46,471 minutes and scored a then-incredible 26,395 points. These numbers had no correlation with anything that had happened in NBA history — which, at that point, was only 32 years old and featured crummy sneakers, bad dieting, coach flights, smoking, poor medical care and everything else that lent itself to short careers. So the thought of another Celtic casually leapfrogging every Havlicek career benchmark would have been staggering in the late-1970s, even if it’s not as staggering now. By the time Pierce’s career wraps up, we’ll remember him as the fourth greatest Celtic behind Russell, Bird and Hondo (in that order). There’s just no way around it. Pierce’s career stands out for two other reasons. First, his size (6-foot-6, with some bulk) and speed (deceptive) allow him to play either wing spot and defend anyone from prototypical two guards (say, Kobe) to bigger two guards (say, Joe Johnson) to pure small forwards (say, Rudy Gay) to inside/outside forwards (say, Carmelo). You can play small ball and stick Pierce at the four if you want, and if you need to run your offense through him as a point forward, he can pull that off, too. On the “The Best 50 Players Ever” list (and he’s on it, in the low-40s and climbing), only Havlicek and Scottie Pippen gave their teams the flexibility that Pierce provided Boston these past 14 years. You can’t discuss Pierce historically without mentioning that. You can throw any four players next to him — as long as one could rebound and another could defend point guards — and fill in the blanks from there regardless of what their skills were. In Game 2 last week, Boston beat the Hawks with Kevin Garnett, Avery Bradley and a bunch of jump shooters and clumsy bangers while running their entire offense through their small forward (Pierce). Ask New York fans — that’s even more difficult than it sounds. even if there were times when you may have said, “He’s probably one of the best 10 players right now” (specifically: 2002, 2007 and 2009), you never would have called him great or anything. But here’s the crucial wrinkle: He’s a very good player who can, occasionally, be great. Sam Jones, Walt Frazier, James Worthy, Manu Ginobili, Dennis Johnson, Reggie Miller, Tony Parker, maybe Pau Gasol, maybe Chauncey Billups and two guys I know I’m forgetting. Either way, it’s not a long list, and Pierce has already had a better beginning-to-end career than any retired guy on it. He’s proven that, in any seven-game playoff series, Pierce will become the best player on the floor for two or three of those games. It’s not an effort thing; you never watch him saying, “Wow, Paul is really trying tonight!” And it’s not a streakiness thing; he doesn’t catch fire the same way that, say, Kobe does. It’s something you can see within the first few minutes. You just kind of know. Uh-oh, Paul is feeling it tonight. a great game. And then he had one, which was what made it so great. At some point that night, every true Celtics fan knew Pierce’s dagger 3/slow job/nodding/stare combo was coming — I would have bet my life on it — and with about three minutes to go, it finally happened, right on cue. Maybe we need to redefine the word “great” a little bit — when you’ve been watching someone for long enough that you know they’re coming through, and then it happens in the exact way you expected, isn’t that a form of greatness? Of course, it’s not officially a fun Paul Pierce postseason until he’s playing hurt. Pierce tweaked his knee during a Sunday walk-around, then exacerbated it during that night’s Game 4 and sprained his MCL. Random coincidence: I sprained my MCL last summer playing hoops, didn’t realize it and played a couple more times before realizing something was seriously wrong. (I thought I had just tweaked it.) What’s weird about sprained MCLs is that you can play at about 70 percent speed (as long as you have a brace), but you’re always thinking about it, you can’t plant hard on it, you can’t really move laterally, and you’re constantly worried your knee might cave on you. The only way it heals? By resting and not playing. (Which is what I eventually did. And by the way, I’m older and significantly less athletic than Pierce, to say the least.) Of course, Pierce didn’t have that luxury, so he played at 70 percent in Game 5 (air balling the potential winning shot) and 70 percent in Game 6, if only because 70 percent of Paul Pierce is better than 300 percent of Marquis Daniels or Sasha Pavlovic. Trailing by three in the final 90 seconds of Game 6, with a petrifying Game 7 in Atlanta looming, Pierce (trapped in the left corner) rolled the dice for one play, drove hard along the baseline to the basket, up-faked Johnson and somehow willed the ball through the hoop, keeping Boston alive and setting up everything that happened next (Josh Smith’s horrific 20-footer, Kevin Garnett’s winning basket, Al Horford’s missed free throw and a textbook Celtics escape). We’ll remember Game 6 for Kevin Garnett’s vintage KG performance, and maybe even for Josh Smith turning into Josh Smith at the worst possible time. Just don’t forget that Pierce layup. It was a great play by a very good player, the kind of moment that sets him apart from just about everybody who ever played basketball for a living. 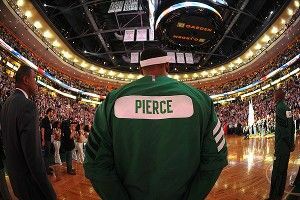 I will remember watching you, Paul Pierce.